Professor Layton and the Unwound Future DS Rom - latest game in the popular series with new time travel adventures and all new misteries to uncover. It is almost unimaginable not to have a Square Enix title in the list of top games. So for the Nintendo DS, there was destined to be a title from Square Enix to rise above the rest. 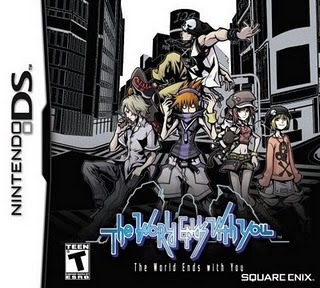 From the team that brought us the ever amazing Kingdom Hearts, comes The World Ends with You. Taking place in the Tokyo’s shopping district, Shibuya, is a modern-day RPG that is totally unique a new in its own way. Because this is the same team that developed Kingdom Hearts, it is easy to see the similarities in the graphics and art work presentation with the Kingdom Hearts series and The World Ends with You, but that is all there is. The World Ends with You has a unique plot and gameplay. The setting is pretty much modern and revolves around Japanese youth culture, like fashion, lifestyle, food, and others. The World Ends with You uses many of the features of the Nintendo DS for its gameplay. Using both screens for battle, performing actions that are based on how you move or slide around the touch screen, and even shouting into the microphone. This game has a feature named Psych Pins which only Neku, the main character can use to use certain abilities. Using Pins in combat lets you gain Pin Points and allow your pins to evolve into much stronger ones. Graphics and soundtrack of the game are pretty well done. Graphics from Kingdom Hearts were quite neat and full of attitude. Same goes for The World Ends with You. The soundtrack has a number of cool music from different genres, bringing more life to the game. The World Ends with You is a pretty cool game with lots of fun, strategy, and attitude. Square Enix together with Jupiter has once again done an outstanding job in making a great game with top quality. compatible with .nds roms and gba roms + includes emulators for nes, snes, sega roms etc. M3i Zero (microSD) Similar to G6 Flash, but instead of built in memory uses microSD / TransFlash memory cards, so you can upgrade the memory.